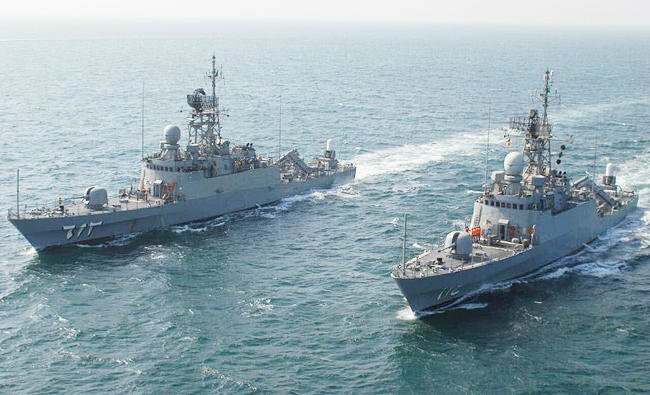 Saudi Arabia and Pakistan are conducting naval drills off Saudi coasts, dubbed Nassem al Bahr, focusing on strengthening capabilities in undertaking security operations across the traditional and non-traditional warfare domains and inter-operability, Pakistani media said. To that end, Pakistan sent a Navy fleet comprising PN Ships Zulfiqar, Tariq, Azmat, Quwwat and Munsif to the Saudi Port of Al Jubail. The fleet also includes Pakistan Navy helicopters onboard ships and P3C Orion Long Range Maritime Patrol aircrafts, which are taking part in the exercise that runs until February 18. On completion of harbor phase, next phase of the Exercise will include joint naval operations at sea. Concurrently, Pakistani and RSNF Marines are also engaged in Joint Marine Exercise Deraa Al Sahil. The two countries first launched the Nassem Al Bahr joint maritime exercise in 1993 as an advanced level maritime exercise involving almost all facets of naval forces. Posted by Jaber Ali on Feb 13 2018. Filed under Headlines, World News. You can follow any responses to this entry through the RSS 2.0. Both comments and pings are currently closed.